“I got you!” Bennett says to the shore crab that I’m helping him hold in his hand. 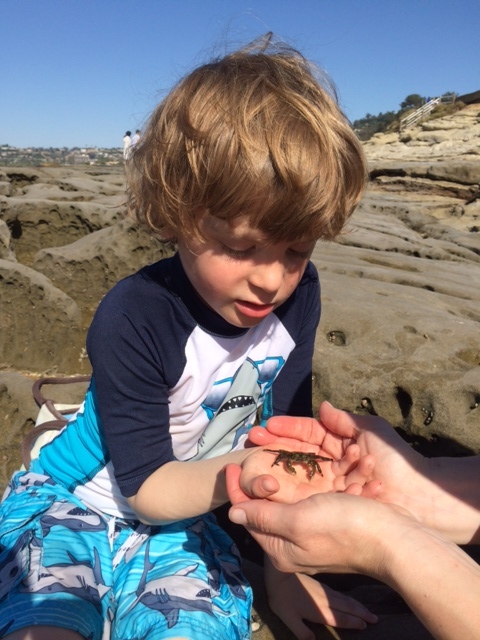 The small crustacean isn’t sure about his human captor and, after a minute, happily scuttles back into a sandstone crevice along the cliff wall at La Jolla Cove in San Diego, Calif.
Bennett holds a small shore crab at La Jolla Cove. It’s low tide on a sunny afternoon and we’re thrilled to discover numerous crabs, small fish, sea anemones and hermit crabs sheltering in deep pools along the rocky point that comprises one of San Diego’s toniest neighbourhoods. Many people come here to snorkel, sunbathe or watch the colony of harbour seals capering just offshore on Seal Rock, but after a morning boogie boarding in the waves at La Jolla Shores, Avery is ready to catch crabs and Bennett is content to repeatedly poke Nemo’s home (a sea anemone) to make it close up. 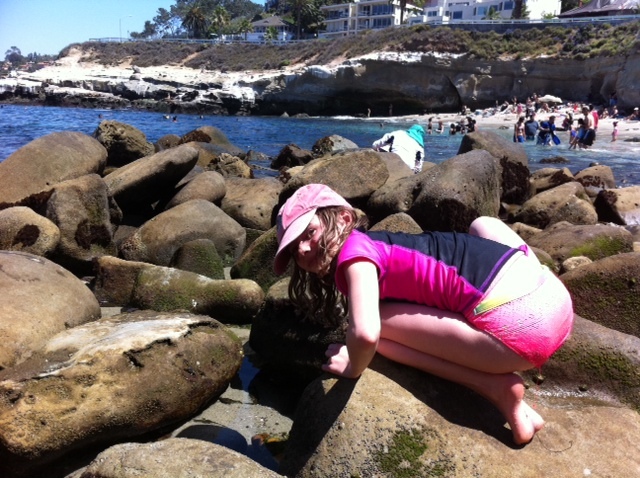 Avery plumbs the depths of every tide pool at La Jolla Cove. Avery has been a tide pool girl since last summer’s trip to Indian Arm fjord near Vancouver. This is the first time Bennett has shown interest in holding or touching sea creatures and I can’t help but wonder if it’s because they are sedentary and trapped in a pool; thus, he can torment the sea anemones and they can’t get away. Regardless, I love that they both love it, and it takes me back to my once-upon-a-time dream of becoming a marine biologist, a fleeting career aspiration that had more to do with how cool it sounded than the actual study of ocean critters. 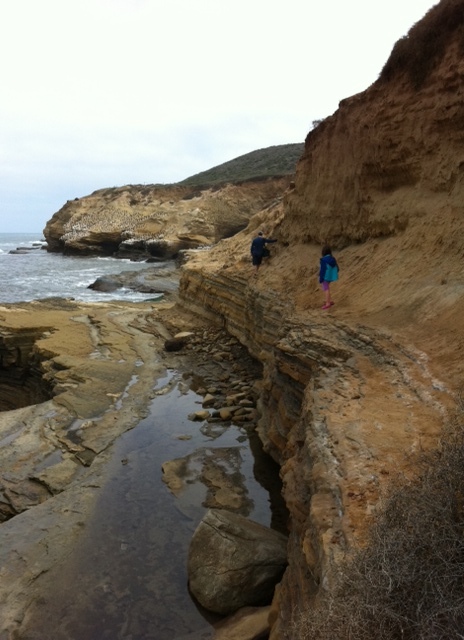 Several days later we head to the tide pools at Cabrillo National Monument at the tip of Point Loma, where Europeans first set foot on the West Coast of the United States. I have never been to this park (entrance costs $5 per vehicle) and though we arrive early, the tide has already risen substantially, making access to some of the tide pools slippery and dangerous. A rising tide at Cabrillo National Monument means limited access to tide pools and a couple of nerve-wracking cliff walks. We manage to see the usual suspects of crabs and sea anemones in some of the permanent pools in the middle zone, where the water is trapped and never drains out. It would have been nice to have made it for low tide, when a small beach is revealed below the cliffs, as well as numerous pools sequestering sea stars, eels and even octopi. Next time! Avery, Bennett and Blake crowd around to see a blue sea anemone. Tip: Consult a tide chart before heading out to San Diego’s tide pools. Low tide is best, and in many areas viewing is even better if it’s a “minus tide” (I have no idea what that means… lower than average?). 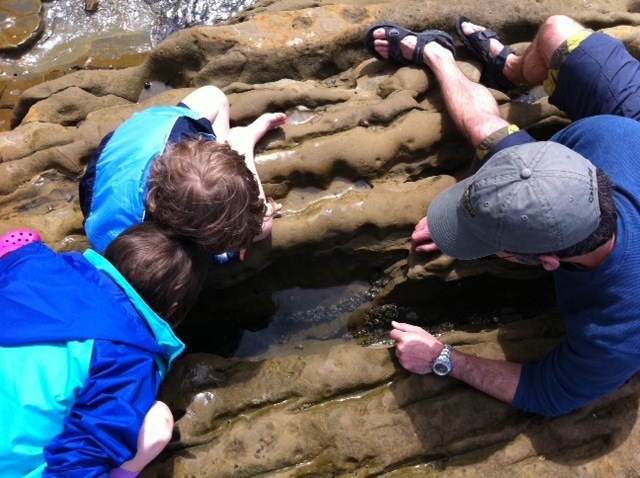 This entry was posted in Travel and tagged Cabrillo national monument, Cabrillo tide pools, La Jolla Cove, San Diego for families, San Diego tide pools for kids, tide pools in San Diego. Bookmark the permalink.